In my research I looked at early American newspapers to uncover public sentiment of deism and deistic beliefs in Maryland and Rhode Island, asking if the ideology played any role leading up to the drafting of the Constitution (1786-1789). Although Maryland and Rhode Island were founded for different reasons, Maryland as a haven for prosecuted Roman Catholics and Rhode Island as an experiment in religious toleration, I choose these two places since both were practicing versions of religious toleration at the time leading up to the drafting of the constitution. My research will look at Benjamin Franklin, self-professed deist and Constitutional drafter, James Madison, drafter and later president, and future Presidents Thomas Jefferson and John Adams, who all held strong deistic beliefs according to secondary sources. The visualization is a word cloud, which pulls the most common word from documents and adjusts the font size of these words according to their prominence in a grouping of articles. The words that appear the most on a given array of articles will be portrayed with a larger font than those that are less predominate. Deism is not one of the most predominate terms on this word cloud. This is attributed to the small number of newspaper articles referring directly to deism during this period. Rather, most articles only mentioned the word deism once or twice while elaborating on distinct topics generally regarding politics or religion. 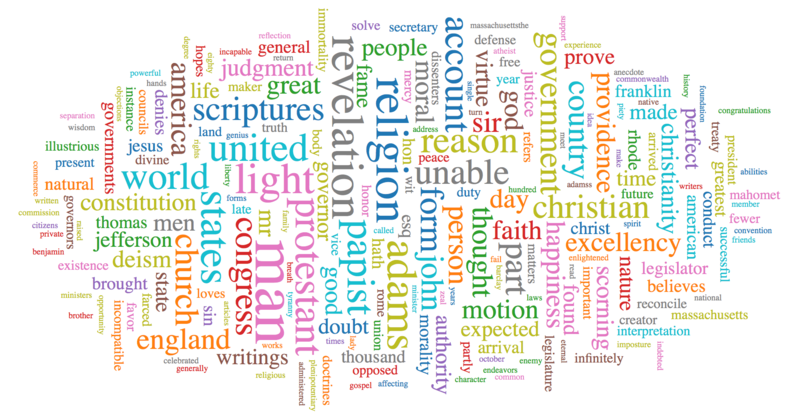 The articles that referred to deism used strong political and religious diction, using words like revelation, religion, states, reason, man, government, county, and united, which do appear predominantly on on the word cloud. The context the term deism was presented within illustrates how deism and deistic belief was a subtle but relevant idea leading up to the drafting of the constitution. 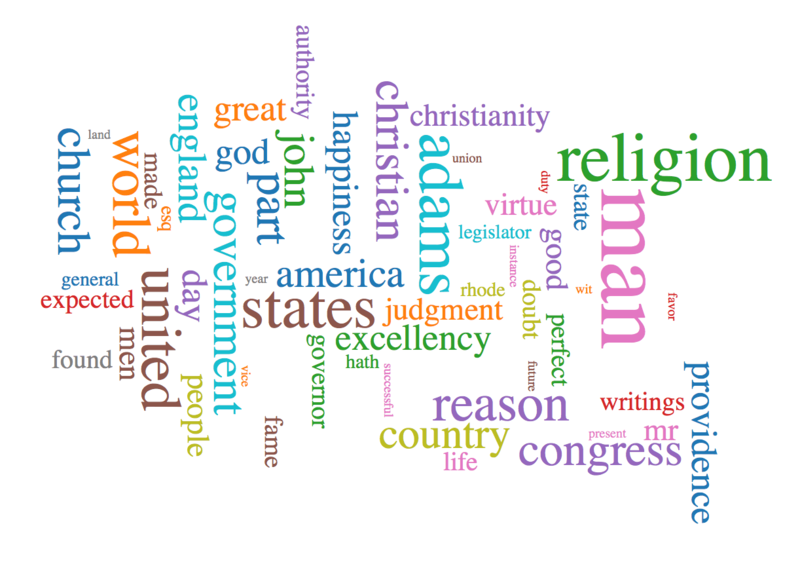 Virtue is a more predominant term on the word cloud, which can be viewed more clearly on the filtered word cloud. Religious disestablishment had been a major issue predating the civil war. “The evangelicals wanted disestablishment so they could freely preach the gospel; the rationalists and deists wanted disestablishment because they felt an enlightened government should not punish people for their religious views” (Kidd 55). Although Rhode Island and Maryland newspapers in 1786 to 1789 were not publicizing it, deistic beliefs played their most central role in the formulation of the disestablished American colonies. For the colonies, the disestablishment of the church denoted that moral virtue would have to be seen without the context of theology. At this time it became increasingly unclear how to maintain and lead a virtuous state without church involvement. Considering that the greater majority of the population associated with a religious establishment, deism, literally embodied by Benjamin Franklin, and its underling moral virtues highlighted the shared religious virtue form the various the religious establishments. These shared deistic virtues would become the catalyst to many of the political beliefs still upheld today, such as our system of checks and balances. The relationship between Thomas Jefferson, the deist, and John Leland, the evangelical Baptist, emphasizes the link between deists and established religions. This was an unlikely friendship considering that Jefferson would “make clear his skepticism about the Bible and traditional doctrines such as the Trinity” (Kidd 55). However, the joint agenda of Jefferson and Leland was a pivotal moment in the drafting of the Constitution. Jefferson and Leland were largely different, similar to how deists and those belonging to a religious establishment are largely distinct. Rather than Jefferson’s and Leland’s differences separating the two, their few similarities drew them increasingly together. As previously mention, the motives of evangelical and deists clearly had discrepancies, but they both shared a common end goal. Although Jefferson and Leland could have lifted a wall due to the others radical differences, since they both understood each other’s motives they eventually drove America towards becoming both religious and religiously free. Untold by the Rhode Island and Maryland newspaper articles, the role of deism, however subtle, largely influenced the drafting of the constitution. Acknowledging this was an era when religious tests for politicians going into public office was something being sought for, deism’s controversial nature may justify the absence from Rhode Island and Maryland newspaper articles. Rhode Island and Maryland newspaper articles usually compared deism to atheism during this period, attaching unfavorable sentiment to the ideology. It may never be known exactly why the role deism played in the drafting of the Constitution was withheld from Rhode Island and Maryland newspapers, but it is important to convey the progress that can be made when two distinct groups build upon what unites them rather than what separates them. Public sentiment towards the ideology, deism, may not have been favorable according the Rhode Island and Maryland newspaper articles, but sentiments towards Benjamin Franklin, James Madison, Thomas Jefferson, and John Adams, who were the living embodiments of the belief, were, for the most part, positive. Newspapers followed these individuals closely before drafting of the constitution, and regarded them well. News articles in Rhode Island and Maryland from 1786 to 1789 would present articles in praise of them and their accomplishments. The detachment, observed here, between the person and the ideology is fascinating. Although the populous did not agree with deistic belief, the Constitution was drafted upon the cornerstone of various deistic premises. Barry, John M. “God, Government And ROGER WILLIAMS’ Big Idea.” Smithsonian 42.9 (2012): 72-90. Beck, Rosalie. “John Leland: the consistent separationist.” Baptist History and Heritage 47.3 (2012): 65+. Hartsock, John. “America’s First Experiment In Toleration.” History Today 43.1 (1993): 22. Kidd, Thomas S. God of Liberty: A Religious History of the American Revolution. New York: Basic, 2010.